Budget 2018 along with many changes to tax laws also introduced a new Section 80TTB. According to this Senior citizen can claim tax exemption up to Rs 50,000 on interest income from bank/ post office fixed deposit, recurring deposit or savings account.Also, if a senior citizen opts to take advantage of Section 80TTB, he cannot claim further tax benefit u/s 80TTA. Non-senior citizens and HUFs are not eligible for 80TTB exemption. 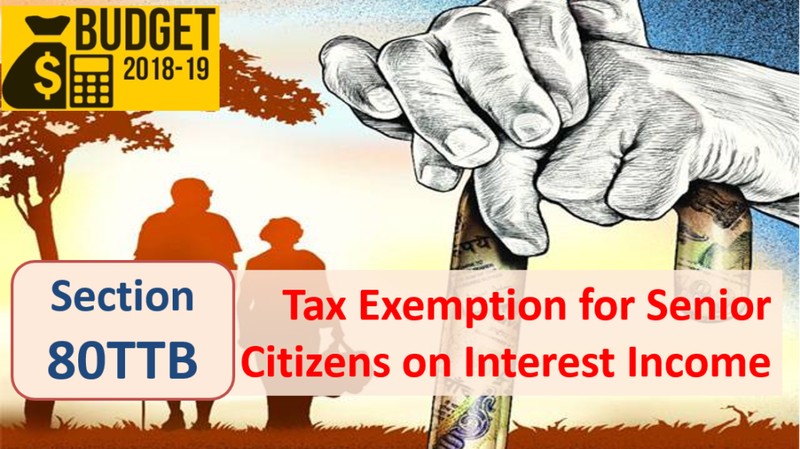 However Non-senior citizens can still continue to avail the tax benefit offered under section 80TTA, where interest income up to Rs 10,000 from savings account is tax exempted. So, going forward from FY 2018-19 (AY 2019-20) there is NO change for people below age of 60 while for Senior citizens they get additional tax exemption for the interest income. Additionally in case of Senior Citizens the threshold for TDS (Tax Deduction at Source) on interest income has been raised from Rs 10,000 to Rs 50.000 from FY 2018-19. In case your income is less than the income tax threshold you can avoid TDS by filling and submitting Form 15H to relevant banks and financial institutions. As 80TTB is newly introduced section, some people might confuse with 80TTA, hence here is a summary of difference between two sections. Section 80TTB is good news for senior citizens who mostly are dependent on interest income for their post-retirement expenses. You can also read about some other announcements for Senior Citizens in Budget 2018. What is the Maximum Income Tax You can Save? How to Save Income Tax for Salaried and Professionals for FY 2018-19? You are requested to kindly clarify whether “interest from company deposits/interest on company/corporate NCDs, etc.” are also covered in section 80-TTB or only “interest from bank/post office” is only covered under this section. Whether interest income u/s 80-TTB is applicable only in case of bank/post office interest income or is also applicable in case of interest income from company deposits/interest on NCDs, etc/interest income from other sources also. You are requested to please clarify whether “interest income” from other sources like FD from Company Deposits/NCDs, etc or interest earned on advances/deposit given to some other person/firm/company is also exempted upto an amount of Rs. 50,000.00 per year in case senior citizens. Nowadays Senior Citizen is benefited in several ways like in terms of interest earned on savings schemes. Most banks provide a higher interest rate to senior citizens compared to the rest. Can you please confirm whether the interest recd on SCSS fixed deposit with Bank, would qualify for exemption of Rs 50000 under section 80TTB ? Will you please clarify what is other income as shown in the last table ?